When is a Snack Bar Not a Snack Bar? 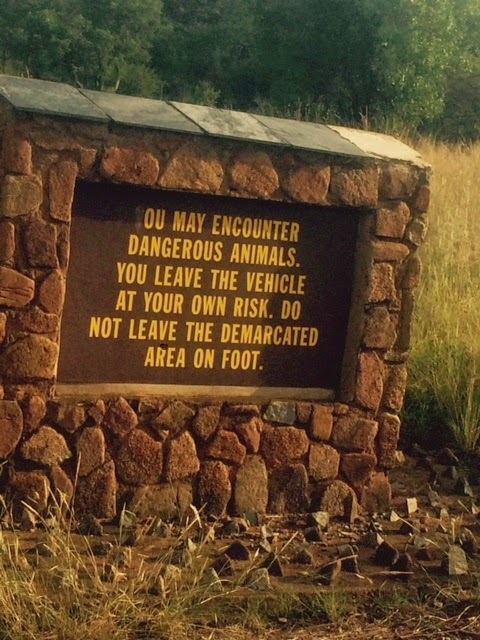 On Sunday we visited Pilanesberg National Park in search of wild African animals. I am sure over the course of this blog there will be lots of posts about safaris and wildlife. The next time we go to see animals I will have a better camera! Using my phone and the ipad is really not cutting it. Pilanesberg is over 2 million years old and is one of only three alkaline volcanoes in the world. Do we have any geologists out there who have any idea what this means? Pilanesberg was declared a national park in 1984 and the park covers 220 square miles (572 km2.) 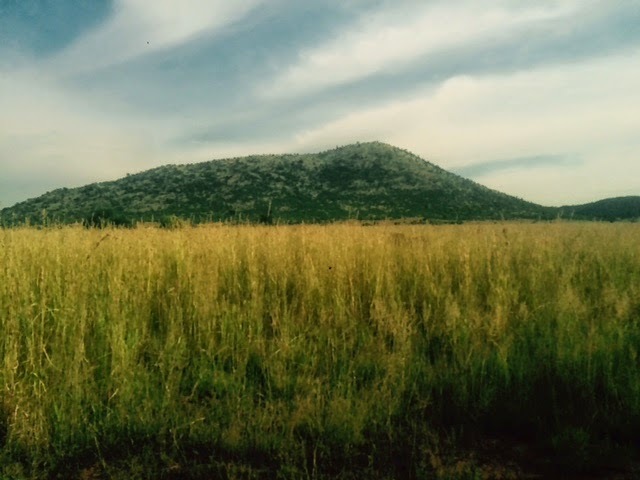 It is the philosophy of Pilanesberg to conserve biodiversity while maximizing the park's economic contribution to the regional economy. The trip to Pilanesberg takes about 2 hours each way from where we are staying. We woke up at 4 a.m. and got on the road by 5 a.m. It seems the first rule of wild animal viewing is that in the summer (which it is here now) animals get up early in the morning to go to the water holes. As the day gets hotter the animals tend to lay low and they are harder to spot. The first part of the trip was kind of harrowing (depends on who you ask because Mr. Deep would say it was totally fine) as we drove through some not great areas of Pretoria in the dark. Once we got on the motorway things improved and we drove through some really small towns and saw some interesting things. First of all the phenomenon of highway pedestrians continues. There were so many people walking along the roads and this was before 7 a.m. on a Sunday. I am thinking people were probably going to church. There are also a lot of people trying to hitch rides. At first we were confused because the would be hitch hikers were not using the thumb gesture as you would (or more likely wouldn't because you wouldn't be hitch hiking) in the U.S. They kind of wave or make like a slow down gesture by moving their palm in a downward motion. We also saw a lot of shanty towns, which is something unbelievable to see and I will definitely write some posts about this in the future. There were also huge fields of sunflowers in full bloom. I tried to get pictures of some of this but there really was no way to pull over so they turned out kind of blurry and as usual don't do the actual scenes justice. We arrived at the park just a bit around 7:15 a.m. After paying at the gate you get a map/booklet and go into the park and just drive along dirt roads looking for animals. First, we made our way towards a water hole. 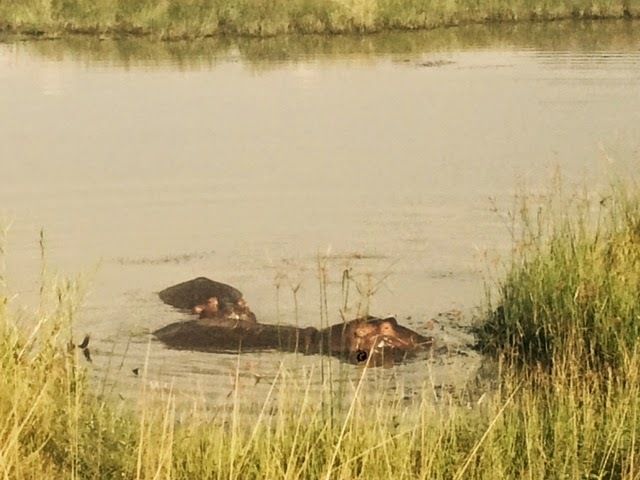 The first exciting animals we saw were hippos. Just like you'd imagine they were kind of lying there and you can only see part of their bodies and their huge eyes. A bit later, we saw a male lion. He was in the grass so it's practically impossible to see him well in the pictures. We saw a lot of what we started affectionately calling "deer" including impalas, kudu, springbok, eland etc. Here's a short video of a wildebeest walking right by our car. There were many zebras out and about which was quite cool. 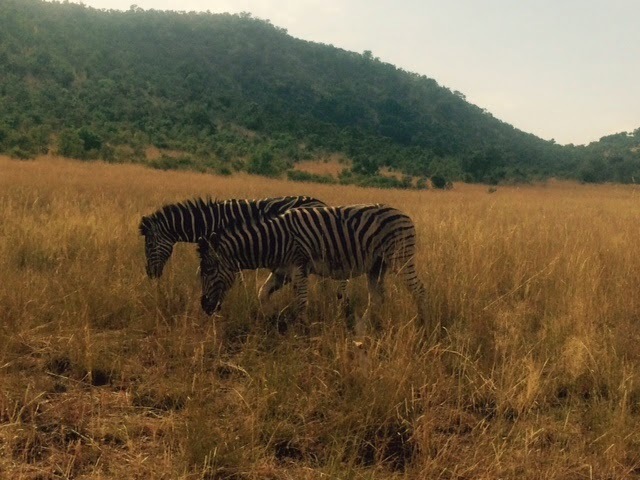 Here's a photo and a short video of some zebras just hanging out and eating grass. You would not believe how intently you are staring when you are trying to spot animals. It's exciting but exhausting because you are looking so hard at the landscape. I can't tell you how many times one of us yelled out "wait, what's that?" only to discover it was just a rock or a tree. I will say though that I think I am a pretty good animal spotter. Mr. Deep and I were really hoping to see elephants and finally we did see one. Back to my earlier point I realize it's not a competition but I did see it first. When we first saw him he was alone just eating grass. Then I guess he wanted to walk toward the water hole and he started walking down the road. We ran into some people who clearly didn't read their map booklet because they pulled their SUV up close to the elephant. You're supposed to back up and stay out of his way! Mr. Deep may not get nervous about driving around sketchy Pretoria in the wee hours of the morning, but he was none too excited to have an elephant walking toward the car and he was definitely not taking any chances. We later saw more elephants at another water hole. Below is a photo and a short video of some of the elephant sightings. We didn't get to see any giraffes, baboons, vervet monkeys, cheetahs, leopards, buffalo or rhinos. We'll definitely go back to Pilanesberg and will also visit different parks in the future! Here are some more pictures of beautiful scenery from the park and one shot from the ride home. 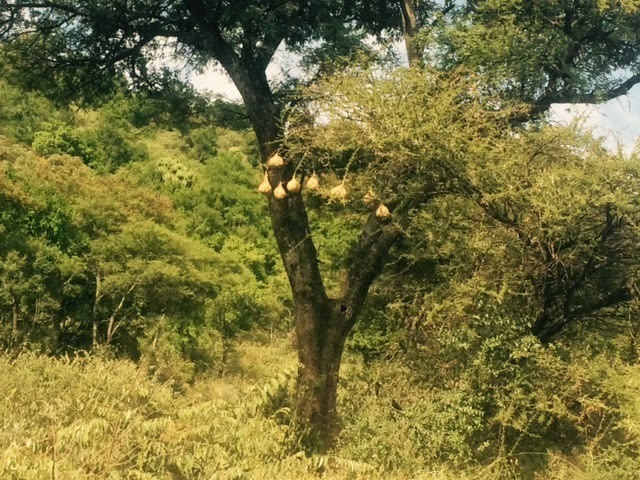 Some kind of nests that we saw a lot of throughout the day. I tried to Google to figure out what they were but couldn't find anything. Isn't this just how you'd picture an African sky to be? If you'd like to subscribe to receive each new post by email please enter your email address here where it says "follow by email" right under the photo on the right. You will receive a confirmation email from Feedburner and you must click on the link in that email to confirm that you want to receive the emails. Fantastic photos!! How amazing to see them in their natural habitat as opposed to a zoo. Very lucky girl! Thank you for sharing! Glad you got there safely! The nests in your photo are from Southern Masked Weavers. Lovely birds, the male builds the nests to attract the female. If she approves she moves in if not, he will keep building new nests, ripping the old ones down at some point. I love watching them, at our first apartment here we had one little guy with up to 7 nests at one time, busy little guy! Thank you Underanafricansun! 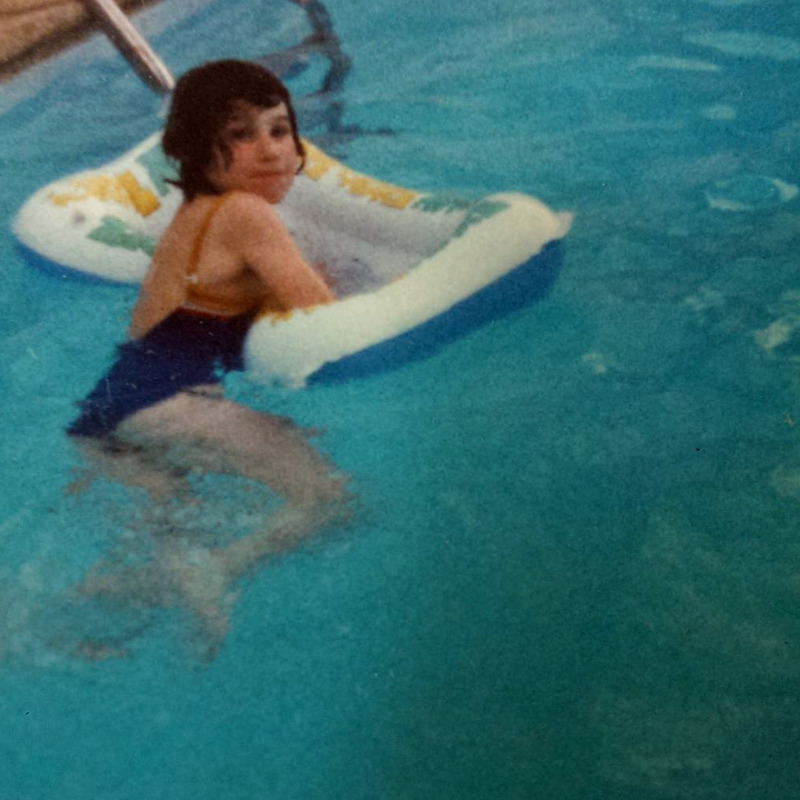 I am so excited that you read my blog. My husband and I both have been reading yours over the past months as we were preparing to come here so we feel like we know you. We look forward to visiting some of the places you've recommended and trying the Soweto bike tour!